Unsecured loans had became a no-go area for banks that burnt their fingers following the global financial crisis of 2008. However, that has not deterred India’s second largest private sector bank, HDFC Bank, from pushing such loans in a big way and capturing 50 per cent of the personal loan market. On Tuesday, the bank launched a new product that could process personal loans in 10 seconds. The response on the first day was so huge that by the end of the day, the bank ended up disbursing personal loans of an average size of Rs 3 lakh in a minute. Arvind Kapil, senior executive vice-president — unsecured loans, home and mortgage loans, said the bank received ‘overwhelming’ response. “Earlier, we had thought it would take 15 days to catch on, but customers have been delighted and have given it clear thumbs-up. It’s a beginning of a journey and we will need to watch and learn as we go along,” he added. Currently, the 10-second loan is available only to salaried employees who are existing HDFC Bank customers. Since the bank has a record of those customers’ transaction history, earning and expenditure pattern, it could process the loans within 10 seconds. According to bankers, personal loans worth Rs 3,000 crore are disbursed every month. 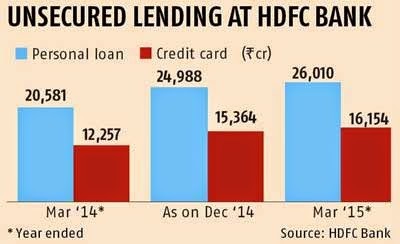 HDFC Bank is keen to get a larger share of the pie. At the end of March 31, the personal loan dues for the bank stood at Rs 26,010 crore, compared to Rs 20,581 crore a year ago. At the end of FY15, personal loans made up 14.7 per cent of the total retail advances. With this digitised personal loan product, the bank is looking at improving its productivity and cost efficiency by 25 per cent. In the months to come, it is hoping a third of the entire personal loan business will be driven by this product. Going ahead, the lender is looking at replicating this loan processing technology to other consumer loans as well. This is going to be part of the bank’s transformation into its ‘GoDigital, Bank Aap Ki Muththi Mein’ strategy. One reason HDFC Bank is confident on unsecured loans is that it has a very low level of non-performing assets. As on March 31, its gross NPAs were at 0.9 per cent of gross advances, while net NPAs were at 0.2 per cent. “We have one of the lowest delinquencies in personal loans, which is also reflected in the overall numbers,” said a bank official. The industry level figures were much higher; gross NPAs was at 4.45 per cent as on March 15, 2015. Net NPAs was at 2.36 per cent. It is not only personal loans, but the lender has been aggressively growing its overall unsecured loan portfolio as well. The, a market leader in the credit card business, saw the portfolio grow 32 per cent in the last financial year. At the end of March 31 this year, the credit card outstanding stood at Rs 16,154 crore, compared to Rs 12,257 crore. According to the Reserve Bank of India data, the total number of outstanding cards at the end of December 2014 stood at 5,748,412.